Come experience living in the round, where worries and everyday stresses vanish. Located at Georgetown Lake, surrounded by recreational goodies whether it's hiking, biking, skiing downhill or x-country, fishing off shore or by boat, listening to the great grey owl or seeing the numerous species of wildlife; life is easier here. Take time to unwind and settle in at the yurt with 706 square feet of space. We left the floor plan open so you can really connect with your surroundings. 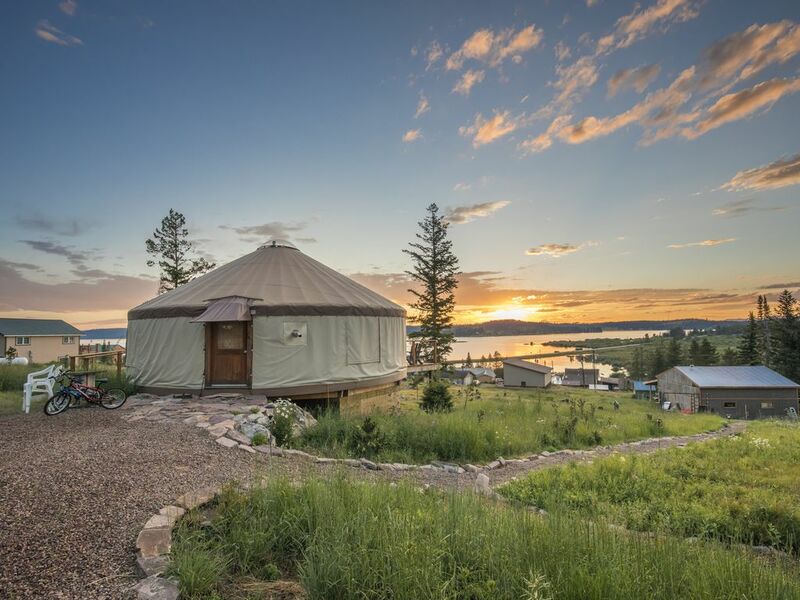 The yurt has everything you need and nothing you don't with a full bathroom, kitchenette with necessary tools, a loft with 2 beds and a view that will mesmerize. On the main floor there is a full size futon to sleep 2 and a pull out loveseat couch for 1. If your party has more than 6 we have provided an air mattress for 2 more. The yurt is heated with a Jotul gas stove that can easily be set on thermostat to your comfort level and when temps rise outdoors, simply open the windows and enjoy the fresh air. Looking up at the dome on a starry night really brings you closer to nature. The yurt has plenty of outdoor space as well with a wrap-around deck accessible by an ADA ramp or through the yurt. Take a moment to sit at the firepit with your family and enjoy the crackling sounds and conversations. If you would rather have someone else do the cooking ,the yurt is within walking distance of the local eatery "7 Gables". Philipsburg and Anaconda are both approximately 15 miles either way and can offer a little slice of culture, not to mention loads of history. Discovery Ski Area is literally at our back door and boasts of 2000+ acres of downhill terrain, one of the most family friendly ski areas you'll find. There is nothing more relaxing than unplugging from your everyday routine and recharging at the End of the Road Yurt. A perfect place for a romantic getaway or bonding with the family. Sean and Kris live just below the property and are usually available. We love it at Georgetown Lake and so do our 2 kids. We have wonderful neighbors, and are blessed with so much recreation. For the peace and quiet, to unplug from technology and plug into the great outdoors. We are within walking distance of the lake. If you are bringing a boat there are 2 access points located at Red Bridge or Grassy Point, both within a mile of the yurt. efficient and equipped with coffee maker, dorm fridge, skillet, hot plate, microwave, toaster oven. Seating for 4. Such a nice surprise! Spacious, cozy warm, great amenities! We hope to return. The pictures really don’t do this place justice!! It’s soooooo beautiful here!! perfectly! Kristine was easily accessible when we had questions. We visited in the winter with very cold temps and it was plenty warm! We hope to be back again!!! Took the family to escape Helena and ski discovery. The kids are begging to go back and didn’t want leave. It was warm, fun and memorable. Thank you for sharing your wonderful yurt! Nice and toasty in the Yurt even with 20 below zero outside! We had a great stay at the End of The Road Yurt! We had a chance to meet the hosts and they are great people! The Yurt was very clean and spacious for our family of 5. We were there in February and the temperatures dropped to 20 below zero one day. But it is was nice and toasty warm in the Yurt throughout! We skied at Discovery and went to local spots 7 Gables and Brown Derby. It's a beautiful area and great skiing! I highly recommend this Yurt to anyone visiting the area! Enjoyed our Yurt experience. A cozy place to vacation. My wife and I enjoyed two nights with our small boys. Worked out great for a couple days skiing at Discovery.